Chicken Tacos is a quick way to get your midweek taco fix! 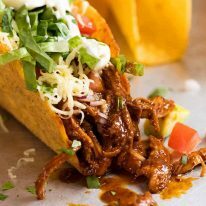 Shredded Mexican chicken that comes with its own sauce, a homemade chicken taco seasoning does double duty to flavour the chicken AND make the taco sauce. 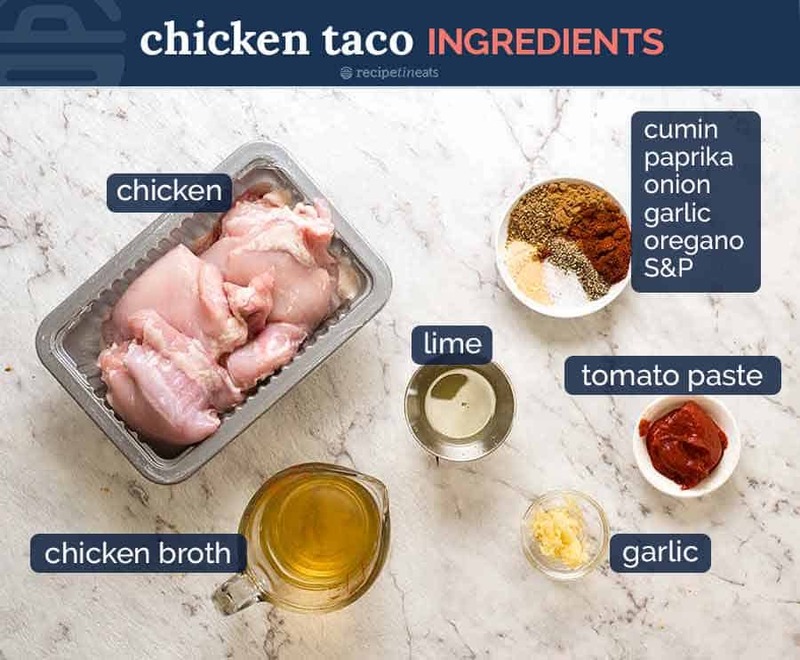 This Chicken Taco recipe is intended to be a QUICK recipe with a 2-in-1 chicken plus taco sauce so there’s no need to make a separate sauce. Tacos always seem to be pitched as a quick ‘n easy dinner. Though cooking the meat might be fast, we need to factor in the extra time to make all the taco fixings: pico de Gallo, guacamole or Avocado Sauce, pickled cabbage, taco sauce, cheese sauce…..
✅ No need to make a separate sauce of any kind. But if you’re so inclined, dig deep to find the strength to pull a tub of sour cream from the fridge…. ✅ Taco toppings can be kept simple. I chopped a tomato, onion, lettuce and onion. BUT having said that, nobody ever complains about too many taco topping options, so don’t let me hold you back!! 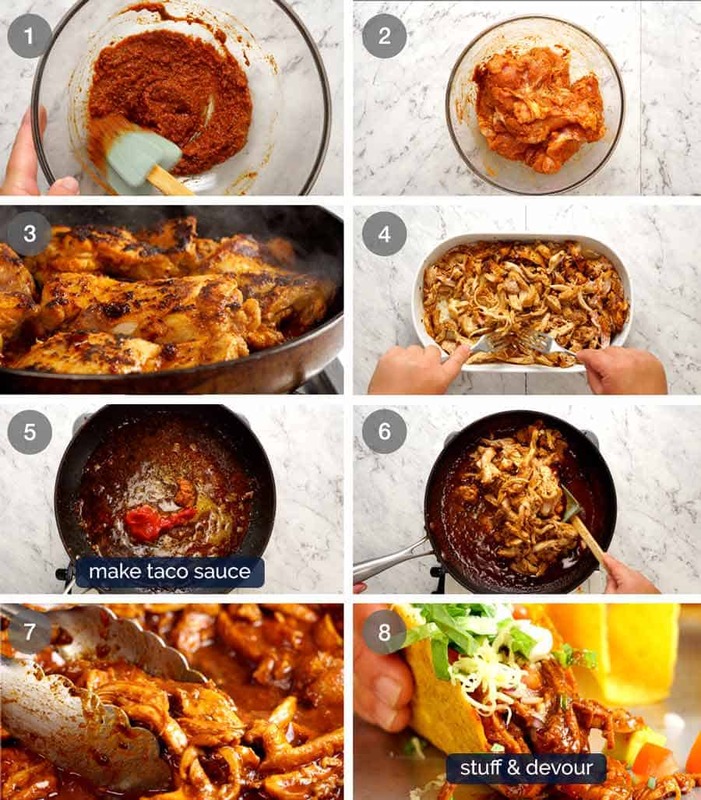 This is a 2-1 chicken taco filling PLUS taco sauce recipe! garlic – it goes in everything around here! chicken broth/liquid stock and tomato paste – to make the sauce. Stuff into taco shells and devour. 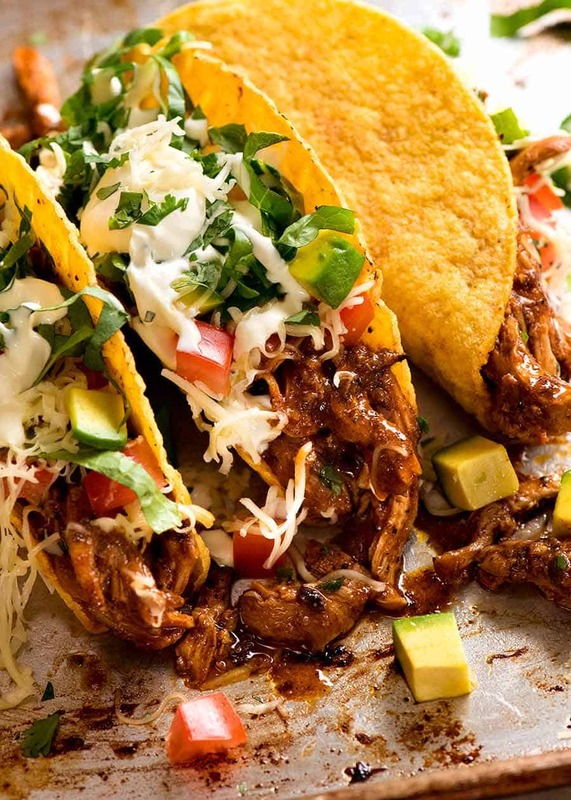 Because this is by no means an authentic Mexican chicken recipe, being that the seasoning is a total copycat of Old El Paso (minus preservatives and artificial flavours), the stuffing vehicle of choice here is good ole crispy corn taco shells. You won’t see them anywhere in Mexico…. but we love them anyway! 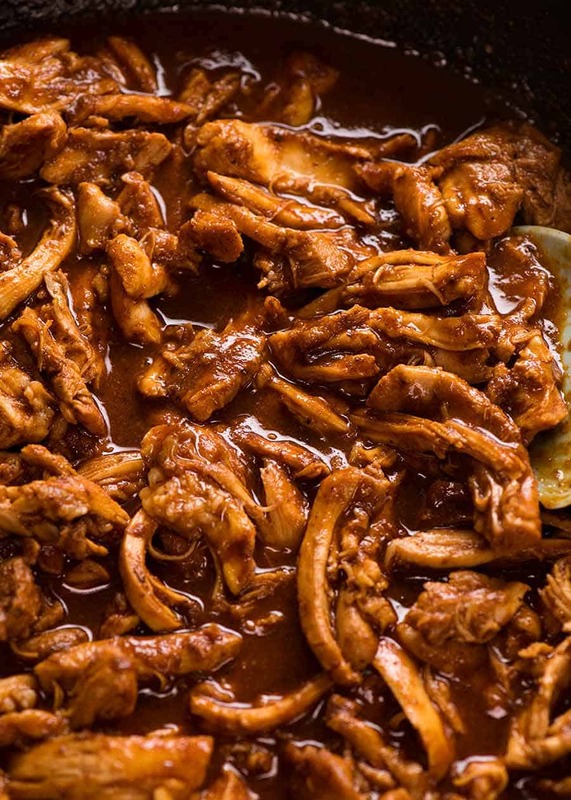 Today’s Chicken Taco recipe is the quicker version of this Mexican Shredded Chicken which is made with a Chipotles in Adobo based sauce, and does not require marinating like this Mexican Grilled Chicken Tacos (a homestyle version of Sinaloa Chicken, a traditional Mexican recipe). There’s room for all 3 tacos in my life, but today’s recipe is the one I make most often because I don’t need to plan for it. 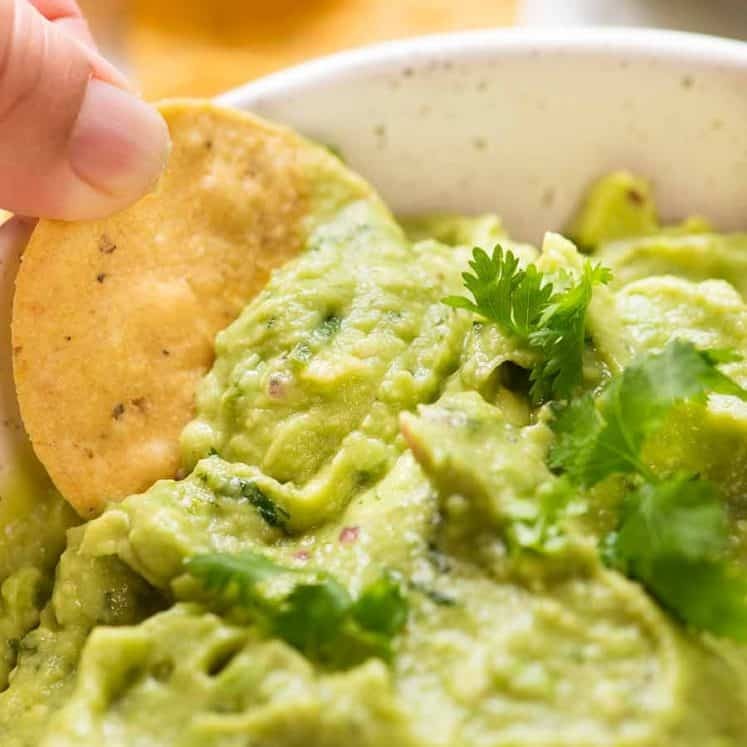 I usually have all the spices and other ingredients (because taco shells – crispy or otherwise – can always be found somewhere in the dark depths of my pantry), toppings are adaptable and it’s high returns for low effort. In the mood for Mexican? 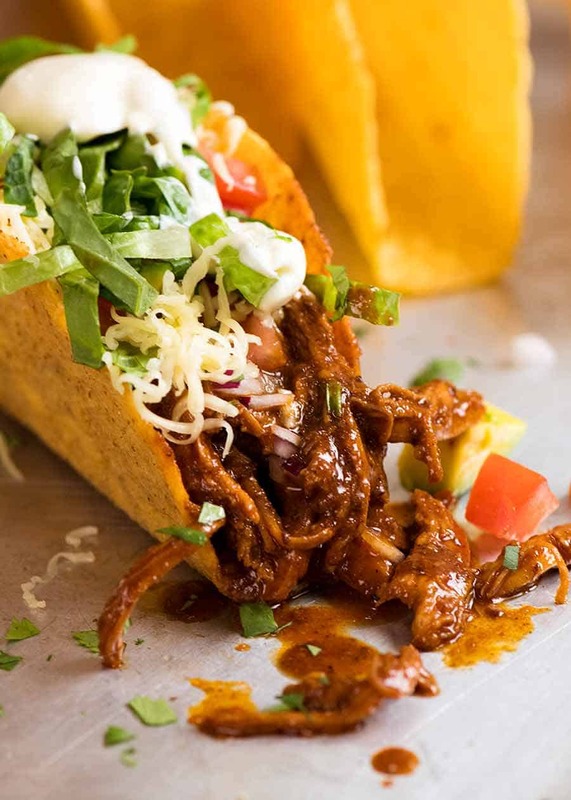 Mexican Pulled Pork – Pork Carnitas, big reader fave! 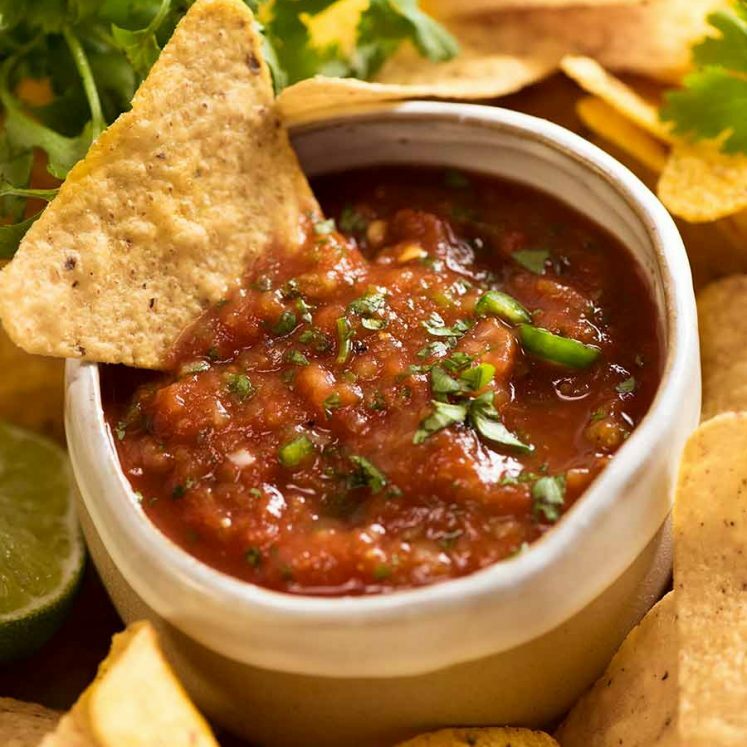 Also, don’t miss Mexican Fiesta – a fiesta menu, starters, mains, sides and dessert! Quick Chicken Tacos - WITH sauce! Recipe video above. A 2-in-1 chicken taco filling: shredded chicken AND sauce made in the same pan using the same seasoning mix! Because it's so juicy and packed with tons of flavour, the toppings can be kept simple and there's not need to make an extra sauce. No marinating required. Place Taco Seasoning ingredients in a bowl. Add 2 tbsp of the chicken broth and mix to form a loose paste. Add chicken, turn to coat. Heat oil in a large skillet over medium high heat. Cook chicken for 3 minutes on each side until lightly seared. Remove chicken into a shallow dish. Meanwhile, shred chicken with forks, or chop (don't worry if raw inside). Return chicken into sauce, toss and simmer for 2 to 3 minutes until sauce reduces to a thin syrup consistency (add water if reduces too fast). Adjust salt to taste. Transfer chicken and all sauce to serving bowl. Warm taco shells or tortillas. Stuff with chicken, making sure it's soaked with the sauce. Top with tomato, avocado, onion, coriander, lettuce and sour cream. Devour! 1. Lime juice - loads of sub options here, just need something to help make a loose paste that adds either sour OR sweet. Lemon juice, cider vinegar, rice vinegar, or even orange or apple juice, or other plain fruit juice (can't taste it at the end). If using a fruit juice can probably skip sugar in sauce. 2. Nutrition for chicken filling and sauce only, per taco (assuming 12 tacos, about 1/4 - 1/3 cup in each). Only reduces to 100 cal if made using breast. Dozer with his friends and a lady in black (yours truly! 😂). Between all the cooking/shooting/filming and Dozer, there is not much white in my wardrobe…..
Nagi, I made these tacos last and they were a great hit and so easy to make. I have made lots of your recipes and the family love all of them. The tacos were yum, yum!! Hi Nagi!!! I’m writing from Mexico City. I’m a huge fan of your cooking and recipies!!! I’ve done many, including the Carnitas. But this time I really don’t agree with this one being Mexican tacos. Here in Mexico, we would never, ever use those hard tortillas, and the chicken filling is not how we would cook it. I haven´t done it, but it could be Tex-Mex cuisine. All my best wishes for you and Dozer (who I really love!) from the other side of the world!!! If you come back, let me know!! I’d love to meet you!!!! I have cooked so many of your recipes so I thought it was about time to leave a comment. Cooked this tonight absolutely beautiful, full of flavour. I love reading through your recipes and trying them out. Thanks so much Michelle, I appreciate the feedback! I look forward to trying your Quick Chicken Tacos! I’m always on the lookout for tasty chicken recipes. Also; I enjoyed your pictures of Dozer on vacation! Dozer is Awesome just like his Mama! Thank you for sharing! Thanks so much Caryn, I hope you love the tacos! Hey, I’d love to make this happen tonight but I don’t have paprika and I’m too lazy to go to the store. Any work arounds? This looks amazing!! Have you got chili powder? As in – US / Canadian chili powder, NOT pure ground chillies! If so, just use that instead. If you don’t have that, just add a touch more of everything else! This was AMAZING .. family went crazy for it. The lime is the chicken was sooo delicious. Thank you, Nagi for another stunning recipe. Hey Nagi – dropping you a note from Washington DC to say that this recipe was an easy and delicious week-night dinner. 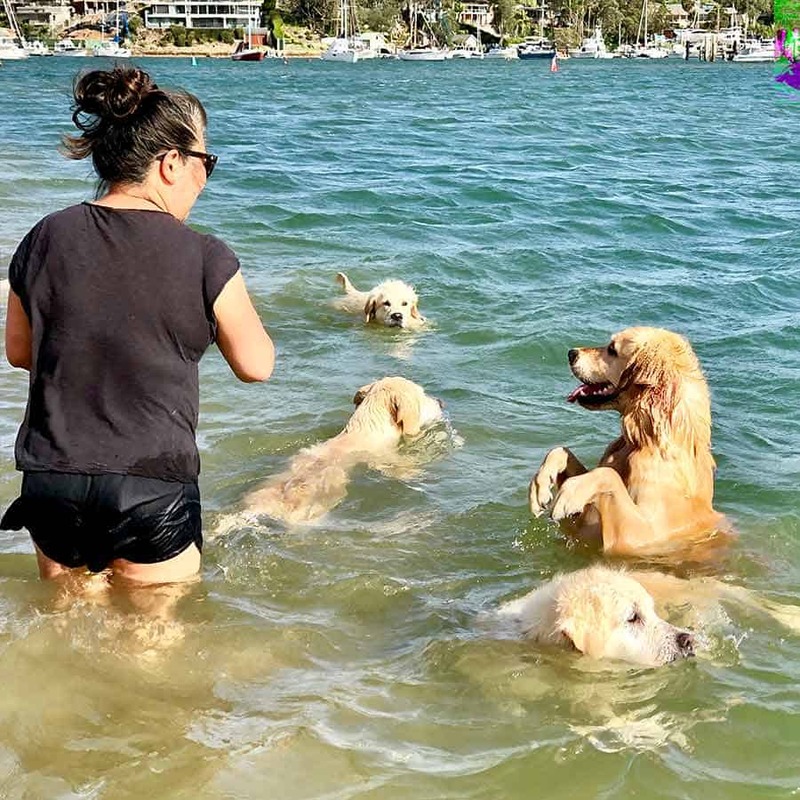 Everybody dove in, including my teens and husband. Thanks so much! Absolutely delicious! The whole family loved it. Such great flavours. That’s great to hear Philippa! This was so easy to make & sooo delicious. My 9 year old son asked for the leftovers the following day! I can’t seem to find taco shells here in Paris so made it with tortilla wraps. A family favourite. Awesome Heidi, you nailed it! Absolutely incredible! Such wonderful flavors. My husband loved this! Absolutely Wonderful were the words that came out of my Husband and I agree!!!!! On the Quick Chicken Tacos with Sauce. The whole family loved this recipe and made us reminisce about a trip to Mexico. I have a 100% success rate with your recipes. Yum. Looks great. Love saucy fillings. Been a while since I had hard shell tacos. Thanks Alberto, you should definitely try it! Nagi, you’ve done it again! Such a super quick dinner but oh so delicious! I can’t repeat what my husband said, but needless to say he’s a big fan of yours! We are going to try the sauce with some slow cooked beef as can imagine that would be great too! the word “DEVOUR” can not explain what transpired last night at dinner when I got finished with this recipe. Everyone loved it. We used tortillas last night and decided for next week to use tacos pitas and a local bread here in Jordan called Mashrouh.